I'd be happy to answer any questions and provide higher-resolution photographs for anyone who is interested in attempting their own. Well done! It's nice to have this documented with part numbers, schematics ... the works. Neutral is not indicated on the display (the OEM neutral lamp is used for this). Neutral shows up as zero on the display (and the original neutral light turns on). I looked into this about 2 years ago, back when John made one, but I never bothered to finish it. If there's enough interest for a group buy, I could design a PCB and get it made. It'll probably be around $50, including the Suzuki part from an 80's GS450. Yeah I'm still working on replacement high beam covers, but after my qualifying exam next week I should have a breather from school. How many times have I been cruising along and tried to shift up one more time ? Or cruising along and the buzz from the bars is a little much... only to find I have two more gear left ? Very nice... if I wasn't so lazy I'd do it. But it seems like a lot work to eliminate merely moving my foot when it's not necessary. If someone were to ask me if the could do it to my bike... hell yeah, will I take the initiative... probably not. Very cool though, I admire people with drive! Grind the pegs down with asphault! Thanks for all the comments and replies! I agree that this upgrade is mostly cosmetic; after a few hours in the saddle a gear indicator becomes less-and-less valuable. That being said, I built this to show that it could be done and to help out anyone who wants to do the same. So far, I quite like this unnecessary perk! Kerry, you are quite right about the conflicting statements on neutral. As indicated in the photo, neutral is denoted as zero (0) on the display and the original neutral light is ON. I will correct this in a later revision. Incidentally, false neutrals are identifiable whenever the zero is displayed but the neutral light is OFF. p.s. any chance this thread makes the sticky or FAQ cut? any chance this thread makes the sticky or FAQ cut? Why didn't _I_ think of that? So let it be written ... so let it be done. 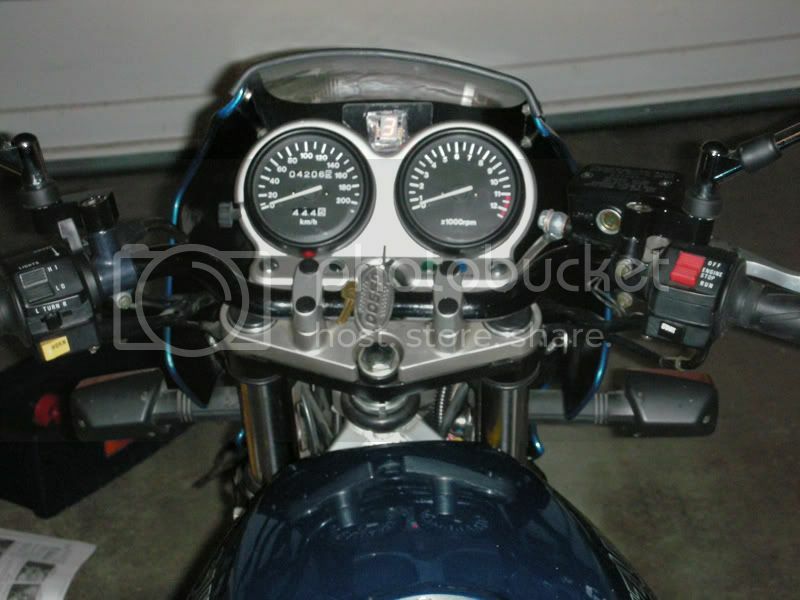 BTW the POS'es suzuki made after 1996 dont have the inbuilt 7 position rotating switch.